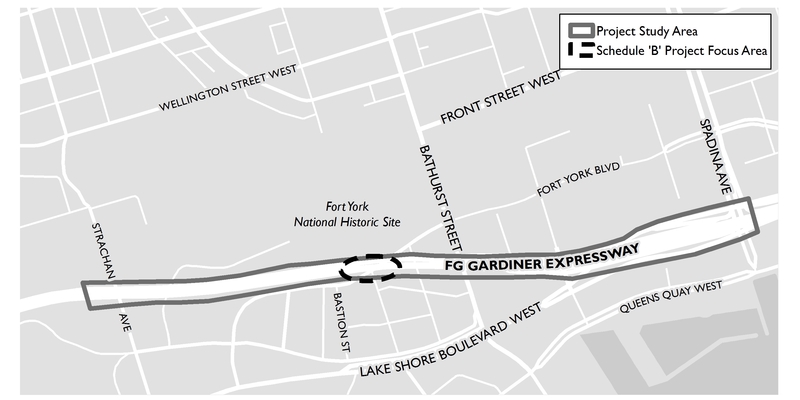 Waterfront Toronto and the City of Toronto are developing 4 hectares (10 acres) of new public space on underused land under the Gardiner Expressway. The space will connect seven neighbourhoods with a new 1.75-kilometre multi-use trail and spaces for cultural programming between Strachan Avenue and Spadina Avenue. A vital component of the Class EA process involves consultation with the public, stakeholders, and government review agencies. As part of this process, a Stakeholder Advisory Committee has been established that includes representation from the community-at-large. Waterfront Toronto will also host Public Information Centres and provide online engagement opportunities to inform the public and receive feedback. The study will follow the requirements of Phase 1 and Phase 2 of the Municipal Class Environmental Assessment (EA) to examine the need for the infrastructure and evaluate alternative solutions. The need for additional Phases of the EA process will be evaluated once the preferred solution is selected. Further details regarding these components will be provided as the study progresses.